The Mayan Calendar ends December 21, 2012! Seen the movie 2012? Liked it? Want to to know more about the Mayan calender? Then check this out! 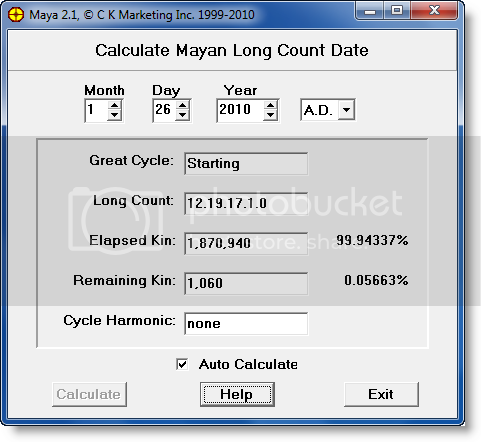 Mayan Long Count Calculator calculates automatically or any user's choice, the remaining time until the Mayan calendar ends. To enter a date you may simply type it in or use the handy arrows to increase or decrease the date. Please note that the program does not check for invalid dates such as February 31st. The modern convention for noting Long Count dates is a series of five integers separated by periods. Each integer represents one of the Mayan day cycles. To stop the program from automatically calculating the Long Count, when entering dates uncheck Auto Calculate. Once you have entered the date simply hit the Calculate button. The Help file makes a fascinating read!